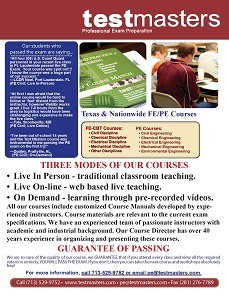 Testmasters’ FE-CBT Online Courses are perfect for busy engineers. The online course option gives our students the flexibility of viewing course lectures whenever, and wherever, is most convenient for them. Testmasters’ online courses are near exact replications of our nationally celebrated classroom courses. These online courses include the same course material and lectures as their corresponding classroom course, as well as the standard GUARANTEE OF PASSING that comes with the classroom option. Additional benefits of the online course are the ability to re-watch course videos an unlimited number of times, the ability to start and stop course videos at your convenience, and an extensive period of 120 days of online access. Students also have options to extend their access beyond 120 days. A lesson plan that parallels the Testmasters FE-CBT Classroom Course Format. Testmasters FE-CBT Online Course Manual with Corresponding Notes for Each Section. Detailed High Definition Video Streams for Each Topic. Get Top Notch Instruction! Every single instructor is a specialist in his or her topic. All course lectures are taught by topic experts, ensuring that our students receive only the highest quality instruction. Options to Review Classes Multiple Times! Students may watch class videos an unlimited number of times. If you don’t understand a topic, simply watch it again. Extra Long Study Period! Each has a standard 120 days of access to the online course with options to extend as needed. Express Shipping of Course Materials! Once registered, you will receive the course material within one or two business days via rush shipping. Crystal Clear Viewing! All course lecture stream in High Definition Video. The video streams also adapt their quality to your internet connection speed, allowing you to stream your videos as efficiently as possible. Save money on travel! Students can watch classes when and where they want whether in the comforts of your own home or at work. Delay the Start of Your Course! Once registered, student can delay the start of the course for up to one year. Get Discounts on Multiple Courses! Students that sign up for multiple online courses get a substantial discount on each additional course if shipped together. GUARANTEE OF PASSING! Students who do not pass the exam will be allowed to retake the course at no additional cost. See the student agreement for more information.